Q: In a world where anyone can find pretty much everything on YouTube for free, can you earn a living selling your videos online? Not blog posts. Not news. Not even games. Videos! So to anyone who has been contemplating creating and selling videos online: there’s never been a better time to pursue this business model because the online video audience is set to just keep growing from here on out. This is why Uscreen exists – to enable anyone to sell videos online. It is a third-party video hosting service that securely hosts videos, allowing all the flexibility and none of the hassle of building a video website. Uscreen provides the ultimate personalized video-distribution platform, offering anyone the opportunity to build a professional website and start making money. For the most skeptical ones out there, this notion of selling your videos online may sound too much like all those other spammy promises of overnight riches. Let’s be clear: It’s not. Far from a guarantee of an easy, passive income source, this will require work and dedication, but if done right, it will pay off handsomely and passively. This blog post will walk you through the ways Uscreen can help you sell videos online, what you need to do and what to expect. 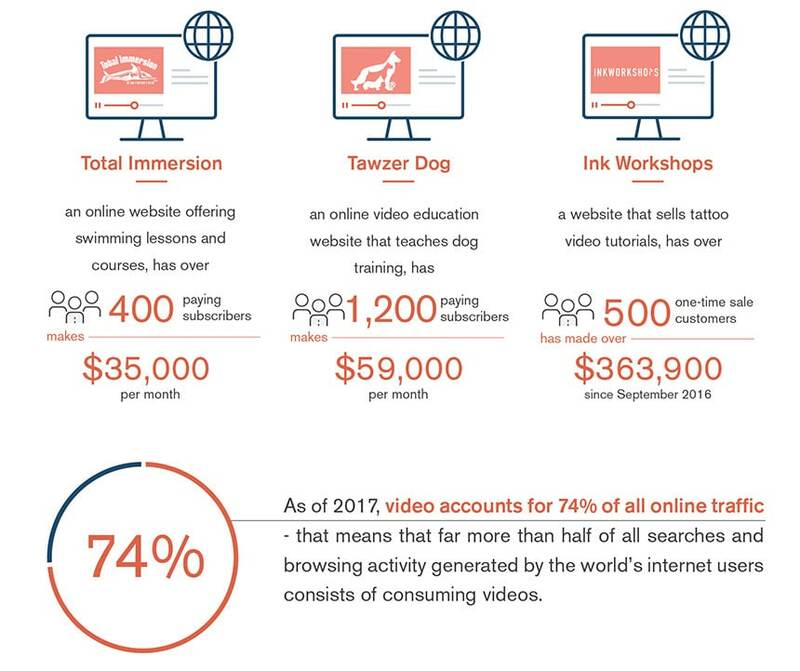 From entertainers to educators, Uscreen has worked with over 1000 customers from vastly different industries in helping them sell videos online. What do all 1000 of them have in common? They all have distinctive angles and clear missions for their video content and online video distribution business model. It’s so important to decide the purpose of your video content, who you want to target and what you will offer to make yourself stand out. Uscreen has helped experts, entrepreneurs, and trainers of all kinds launch their online video-distribution websites and monetize their content. Care for a quick example? 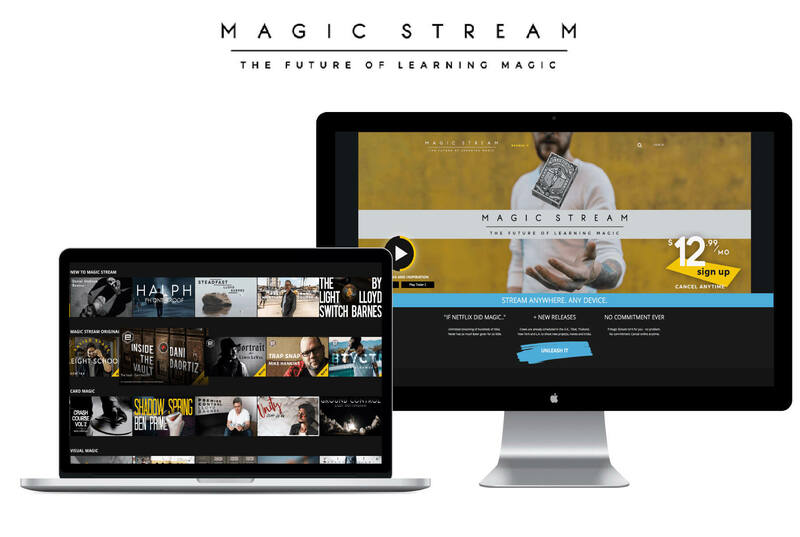 Magic Stream is an incredibly successful online training center for aspiring magicians. As of July 27, 2018, Magic Stream generates about $27,000 a month. Magic Stream educates viewers on different magic techniques, covering sleight of hand, mentalism, visual magic, coin magic, and more. The website is beautifully-designed, sleek, and professional with a wealth of content for subscribers to enjoy. So what is Magic Stream’s key to success? It sells video subscriptions. That means that instead of just getting a one time fee from customers, Magic Stream generates automatic recurring monthly income off of their 2000 monthly subscribers. If Magic Stream can make $27K a month on 2000 subscribers, you too can sell your videos on a subscription basis (if you put in some work and effort). Ready to make money selling your videos online? While your first instinct may be to upload your videos to YouTube and hope to make the mega bucks from the ad revenue, that’s not the right way to sell your videos online. Even though the Google-owned platform boasts more than 1 billion unique users and a 50% growth rate in the number of hours watched year-over-year, it isn’t exactly the best way to sell your videos online. The reason is simple: 55% of the money earned from ads goes to the creator and 45% to YouTube. That’s a big cut. This may sound like an enticing offer when you think of the sheer size of YouTube, but it has only been profitable for a small percentage of their largest partners. If you have a serious viral video (with millions of views), only then do you start seeing any significant income coming in. On the other hand, more astute business owners, online instructors, and video creators are resorting to another strategy: posting long teasers with lots of useful information on YouTube, where many eyes will see them, and then linking them to a paid platform site like Uscreen where visitors will have paid access to the juiciest and most valuable content you have to offer. If you’re interested to learn more about this strategy, we’ve listed detailed instructions in our How to Sell Videos Using YouTube blog post. Not only is this a much savvier strategy, it also ensures that your content is safe from piracy and unscrupulous vendors who want to make a quick buck off of your hard work. The first step in setting up your own business and online video store is to determine exactly what it is you want to sell. The possibilities in terms of knowledge transfer are endless, and odds are your expertise in a particular field can very well become a money-making idea. Can you teach others a foreign language? Can you teach others how to knit or sew? Are you an expert in a certain sport? Can you show others how to remodel their home? Are you a programmer or graphic designer? To test the waters and see if your idea is a money-making one, try offering free video through your blog or YouTube and gauge the reception. Also, do some heavy research on other sites such as Lynda, YouTube, and Udemy to see if there is already demand for your product. If there are others already offering similar courses, then see how you can improve on them and offer something people will actually be willing to pay for. Who is your target audience (age group, interests, lifestyle)? What is the specific outcome for anyone who subscribes to your video website will have (entertainment, education, training)? What special added value will differentiate your video website from your competition? Once you can answer these, you’re good to start creating your content. This may consist of videos, eBooks, podcasts, articles, and more, for a comprehensive subscription package. After all, the more high-value content you can offer, the more likely you are to tempt people to invest. Want to learn all of this in more detail? Check out Uscreen’s brand new Video Business School! It will guide you through the whole process of launching a business from start to finish. Now is the time to start thinking about how you want to monetize your videos. There are three simple monetization strategies to choose from when selling videos online: SVOD, AVOD, TVOD. Subscription-based businesses (SVOD) have become incredibly popular because of their convenient nature to both video sellers and consumers. Alternatively, one-time purchases (TVOD) ask users to pay a single fee for ongoing access to content, while rentals and pay-per-view allow users access to content for a specific period, such as 24 hours, seven days, a month etc. Uscreen allows you to set any payment structure you think your audience will prefer, and you can accept numerous currencies for international reach and the more freedom subscribers have, the more valued and respected they will feel. Needless to say, content is the center of your new online video business model. If you have the skills to produce and edit your own video, you can ideally create your own video material (and it doesn’t even have to be super fancy). You can also hire a video production team to help you take care of it if that’ll make you feel more comfortable. If your video content revolves around eLearning and online courses, you can use more than just video content to support your teachings and help your students get a dynamic education. As your primary teaching materials, your course content can include videos, PDFs, podcasts, downloadable audio files, ebooks, slides, and evaluations such as tests and quizzes. For example, if you’re offering a fitness program, you can complement your training with a weekly menu of healthy meals. Also, additional tips and insights can be included in podcast form, so that your customers can listen while on the way to work or school. Once you have created enough videos to start selling, you’ll need to upload them to the video streaming platform of your choice. Uscreen is designed to be as easy to use as possible, saving you time, effort, and money since you can do it all yourself with no coding experience needed. You can upload your videos quickly and securely from any browser, all of which will automatically be optimized for mobile sites. Why do we do this? Mobile is overtaking desktop searches in many countries, and any site that fails to cater to this is liable to shoot itself in the proverbial foot. If you already have videos on Youtube, Vimeo or Wistia, you’re already ahead! With Uscreen, there’s no need to re-upload your video content. You can sync to your Youtube, Vimeo or Wistia account and automatically upload all your content over to Uscreen. This saves you the headache of uploading everything again. Navigation is simple, and the Uscreen team is on hand to answer any questions you may have at any time. To ensure maximum engagement with users, your site has to be organized neatly and professionally. You can create a menu similar to those on Netflix and Hulu that feature helpful links to chapters, episodes, and other digital content you have uploaded (such as PDFs, documents, audio clips), and even timestamps for videos’ starting points. All of this minimizes the risk of users becoming confused or frustrated. Keeping your library well-organized is key to quality of experience, so it’s common practice to separate content into relevant categories. You can even schedule content to automatically be added or removed from subscribers’ libraries and can add subtitles in various languages. Every single aspect of your Uscreen website is customizable: your player-type, chapters, episodes, and your color schemes. On top of all this, you can add a unique logo and video banner to reinforce your brand. Do you need special technical knowledge to do this? Uscreen offers a simple, plug-and-play web builder so you can see how the finished design will look as you build it. No coding. No complex technical jargon. Apps are now an essential part of running an online business. 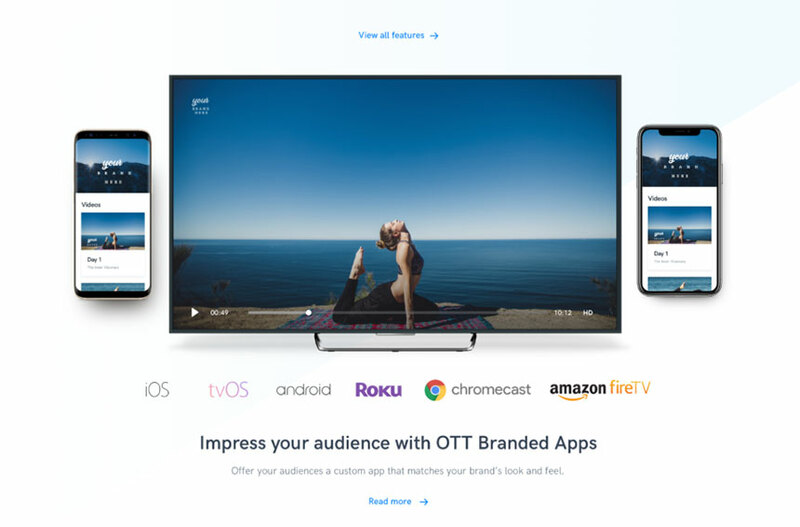 With Uscreen, you can add your logo, branding, and distinctive design to various platforms across Android, iOS, Roku, Chromecast, and more. 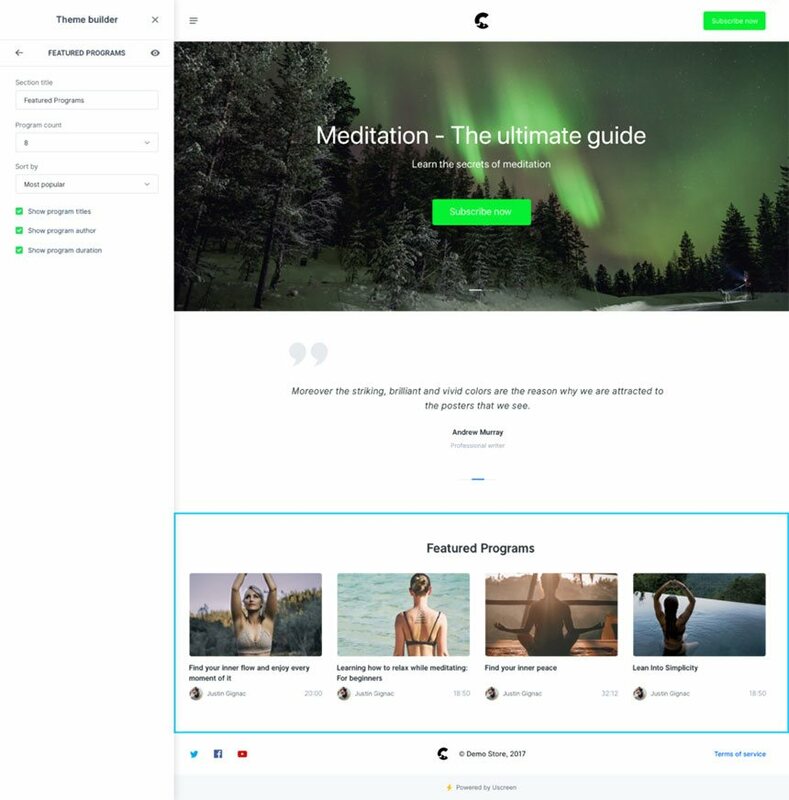 We publish and maintain these to ensure your content is always on sale with the latest updates and features and can customize an app to suit your exact requirements – just ask. Finally, to get the word out about your new course, announce the release of your product through social media channels and Google Ads. You can also post enticing teaser videos on YouTube to get visitors interested in your content. Once your money starts rolling in, Uscreen is bound to swoop in and demand a huge chunk of it, right? Uscreen is 100% royalty and commissions free, which means you get to keep 100% of your profits. All you have to do is pay a set monthly fee, and Uscreen is here to support you along the way. This is a chance to build a true online presence outside of video platforms like YouTube and Vimeo, establish your own brand and carve your own niche. Sell videos online. Reach the people you want to reach. Spread the message you want to spread. And make the money you want to make. Feeling inspired? We hope so. As you can see, using Uscreen is quick and easy, even if you’re just discovering the joys of the internet. Our team will talk you through any stage you find even a little too complex. Trust us to help you get where you need to be. OTT video apps have started a video revolution. They allow you to instantly stream the videos you love to your favorite device. Whether that’s a film, a session with your favorite Yoga instructor, or learning how to go cave-diving, you can watch it wherever and whenever suits you.